Many people notice their gums are receding at some point in their lives. Most of the time, it’s not a cause of concern. Gums can recede a little with age. However, if the receding continues, it could end up causing issues for your teeth and your teeth may require a tissue grafting procedure. The reason there is oral pain is because when the gums recede the root is exposed, which has nerve endings. That’s why when you eat or drink cold or hot things, you’re affected by them. If these symptoms sound familiar, you most likely have receding gums. But how did it happen? The main cause is poor oral hygiene, which leads to periodontal disease. This oral issue causes bone and tissue loss that supports teeth. This can cause an inflammatory reaction. People who have good oral hygiene can also suffer from receding gums. Usually, they have inherited the oral issue. Genetic factors that contribute to receding gums include the position of the teeth and gum thickness. Over-brushing and brushing too hard are other causes of gum recession. The physical wear of the gums can occur and usually, it’s worse on the left side of the mouth. This is because most people are right-handed and place more pressure on the left side of the mouth. Usually, these causes happen over time, so it’s a surprise to people they find out the cause of their receding gums. 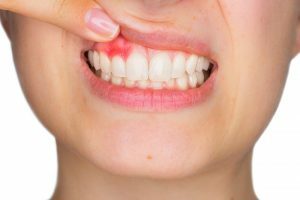 The first line of attack is to alleviate what is causing it, such as improving oral hygiene, removing piercings, and repairing dental treatment damage. Once the cause has been eliminated, fixing the receding gums with a tissue graft procedure is the next step. The best thing to do for receding gums is to contact a periodontist. This oral specialist has experience with tissue grafting procedures. This procedure involves taking gum from another part of your mouth and placing it where the receding gum has occurred. After the tissue grafting procedure, the gums will thicken, which will cover the exposed root and stabilize the affected teeth. If you believe you have receding gums, contact PerioLife Periodontics & Implant Dentistry. Our doctors, Dr. Randhir Kapoor, and Dr. Rishika Kapoor are highly experienced periodontists with offices in Dallas, Irving, and Keller. Contact us today to book an appointment at the location most convenient for you.